Step by step tutorial on building RESTful API using Node.js, Express.js, Sequelize.js and PostgreSQL. A comprehensive step by step tutorial on building RESTful API using Node.js, Express.js, Sequelize.js, and PostgreSQL. In this tutorial, we will show how to create a little complex table association or relationship with CRUD (Create, Read, Update, Delete) operations. So, the association or relationship will be like this diagram. That the simple explanation for what we will do in the steps of this tutorial. We assume that you have installed PostgreSQL server in your machine or can use your own remote server (we are using PostgreSQL 9.5.13). Also, you have installed Node.js in your machine and can run `node`, `npm` or `yarn` command in your terminal or command line. Next, check their version by type this commands in your terminal or command line. This will create Express.js project with the EJS view instead of Jade view template because using '--view=ejs' parameter. 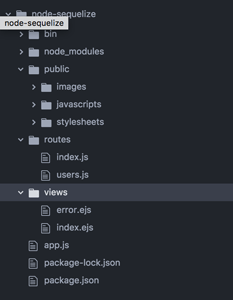 Next, go to newly created project folder then install node modules. There's no view yet using the latest Express generator. We don't need it because we will create a RESTful API. Before installing the modules for this project, first, install Sequelize-CLI by type this command. To install Sequelize.js module, type this command. Then install the module for PostgreSQL. We use the same configuration for all environment because we are using same machine, server, and database for this tutorial. We will use Sequelize-CLI for generate a new model. Type this command to create a model for `Classroom`, `Student`, `Lecturer`, `Course` and `StudentCourse`. That command creates a model file to the model's folder and a migration file to folder migrations. Next, modify `models/classroom.js` then add association with `Student` model inside `associate` function. Next, modify `models/student.js` then add association with `Classroom` and `Coursemodel` models inside `associate` function. Next, modify `models/lecturer.js` then add the association with `Course` model inside `associate` function. Next, modify `models/course.js` then add association with `Student` and `Lecturer` models inside `associate` function. Finally, for migrations, there's nothing to change and they all ready to generate the table to PostgreSQL Database. Type this command to generate the table to the database. Open and edit `controllers/classroom.js` then add this lines of codes. In that controller, we have all CRUD (Create, Read, Update and Delete) functions. To make this controller available via controllers folder, add this files for declaring this controller file and other controllers files. For the router, we will use the existing router that generated by Express Generator. Open and edit `routes/index.js` then declare the Classroom controller after another variables. Add this routes after existing route for Classroom controller. Type this command to create a controller and router file for Student model. Open and edit `controllers/student.js` then add this lines of codes that contains full CRUD function for the Student model. Next, open and edit `controllers/index.js` then register Student controller in that file. Next, open and edit `routes/index.js` then add a required variable for student controller. Add the routes for all CRUD function of student controller. Type this command to create a controller and router file for Lecturer model. Open and edit `controllers/lecturer.js` then add this lines of codes that contains full CRUD function for Lecturer model. Next, open and edit `controllers/index.js` then register Lecturer controller in that file. Add the routes for all CRUD function of lecturer controller. Type this command to create a controller and router file for Course model. Open and edit `controllers/course.js` then add this lines of codes that contains full CRUD function for Course model. Next, open and edit `routes/index.js` then add a required variable for course controller. Now, we have to make the association more useful. To make a Classroom include the students, add this function to `controllers/classroom.js`. Next, add this new function to the route file `routes/index.js`. To add a lecturer include a course, add this function to `controllers/lecturer.js`. To add course for student, add this function to `controllers/student.js`. That's a few of Association feature that might be useful for your project. We will add another useful function to this article later. Type this command for run the application. Open the new terminal tab or command line tab then type this command for save or persist classroom data include with students. Connect to the database then running the queries. Using `curl` you just get a classroom then the students will included with the response. Run this `curl` for save or persist Lecturer, Course and Student/Course data. Now, you can see the data exists using `psql` query for each table. That's it, the Node.js, Express.js, Sequelize.js and PostgreSQL RESTful API. You can get the full working source code on our GitHub.